Priests have ever since World of Warcraft was introduced in Vanilla, been considered as the one and only pure PvE healing class. Although nowadays (3.3.5) other healing classes/specs have made their breakthroughs and nearly all healing specs are viable, priests are still obviously on a whole different level. Priests can’t just heal, though, they are the most feared cloth wearer of the battlegrounds, Shadow Priests (or Spriests). This is what we will be using for leveling; their OP buffs, self healing and huge DoT based damage is sure to not only get you to 80 in no time, but kill everyone you meet on the way. Shadow Priests become one of the easiest classes to level at around 40. Solo with ease from average to moderate elites, without having to worry about mana. Be the only « cloth wearing » class that can take beating. Get in to nearly any group as a healer (VERY needed) OR a dps and do well at it. 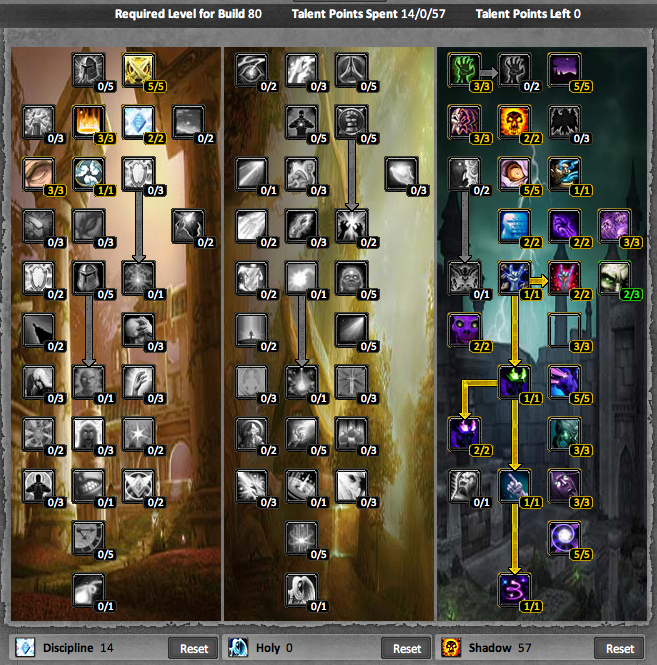 The leveling spec we are going to cover in this guide is Shadow due to it being a priest’s only DPS talent tree. Despite being « DPS », it has still great sustain. Shadow relies highly on its many DoT (Damage over Time) spells, slowly draining its enemies while using shields and various self healing abilities to survive the hitting. – Until you get Shadow Word: Pain, spam Smite. – When you get Shadow Word: Pain, cast it right after you’ve cast your first Smite. Rotation: Pull with Smite, cast Shadow Word: Pain, spam Smite. Refresh Shadow Word: Pain if needed. – Open with Mind Blast and Shadow Word: Pain. – Keep casting Mind Blast as soon as it’s off cooldown. – While Mind Blast is on cooldown, spam Smite. Rotation: Pull with Mind Blast, cast Shadow Word: Pain, spam Smite. Keep casting Mind Blast as soon as it’s off cooldown. Refresh Shadow Word: Pain if needed. Glyph of Mind Flay (level 20) – Increases the damage done by your Mind Flay spell by 10% when your target is afflicted with Shadow Word: Pain. Glyph of Shadow Word: Pain (level 15) – The periodic damage ticks of your Shadow Word: Pain spell restore 1% of your base mana. Glyph of Shadow (level 20) – While in Shadowform, your non-periodic spell critical strikes increase your spell power by 30% of your Spirit for 10 sec. – Rating Buster : Rating Buster converts stats into ratings and allows you to quickly compare two items to see which one is the best for you. It can, for example, tell you how much spell power an item with 36 int would actually give you and if that item would make you gain or lose that specific stat when equipped. – Range Display : A light addon that shows the distance between you and the mob (or npc/player). Very useful to know exactly when you are in max range for a Mind Blast or any other spell. It is easily configurable as well. – Quartz : Considered the best spell casting bar addon, Quartz gives you hundreds of awesome features, including latency and range (to your target) tracking, while still staying relatively lightweight.